Kate Haywood, the young queen’s personal musician, has been keeping busy playing for a merry round of summer parties where famed astrologer Dr. John Dee and his fantastic horoscopes are all the rage. 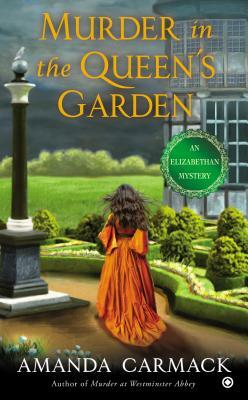 However, Elizabeth’s favorite stargazer fails to predict the discovery of a skeleton in the queen’s garden—and that the victim’s identity will call his own innocence into question. When the doctor’s pupil is the victim of a second murder, the concerned queen enlists her trusted Kate to clear the accused killer of wrongdoing. But will the stars align to light Kate’s path through a tangled thicket of treachery to save Elizabeth’s prized astrologer and protect the queen from those who threaten her reign? Amanda Carmack is the author of the Elizabethan Mystery novels including Murder at Westminster Abbey and Murder at Hatfield House. Amanda Carmack is a pseudonym for a multipublished author. Her books have been nominated for many awards, including the RITA Award, the Romantic Times Reviewers’ Choice Award, the Booksellers Best, the National Readers Choice Award, and the Holt Medallion. She lives in Oklahoma.